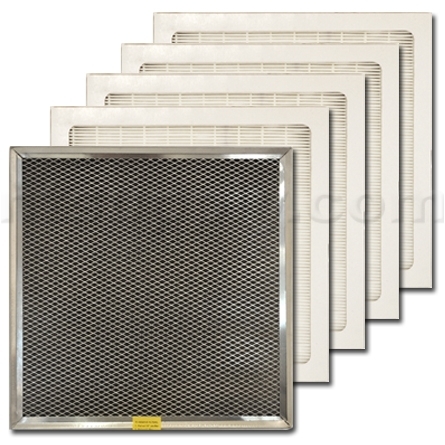 Filter Kit for Santa Fe Advance Dehumidifier (4027419). Includes 4 pleated filters and 1 washable pre-filter. Check pre-filter every six months. Clean and/or replace when filters are visibly dirty. The 1/4" washable pre-filter should not to be discarded. Inspect for debris, dirt, or other obstructions. Wash the 1/4" pre-filter every time the 1" pleated fabric filter is replaced. To clean the 1/4" pre-filter, remove filter from the unit, rinse the 1/4" pre-filter in water with the water flowing through the aluminum support mesh side. Allow the filter to dry completely before reinstalling. Replace pleated filter every six months.